As winter approaches, we have had a number of storm fronts move through the area with a lot of wind. A portion of our property is adjacent to neighboring farm fields so there are no wind breaks to slow down any strong winds. We often have a variety of small branches come down after a typical storm. 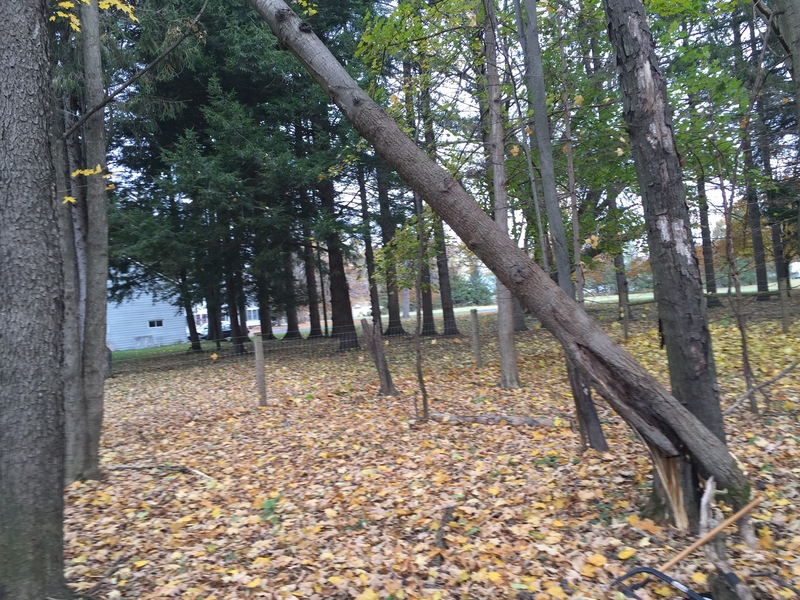 Recently, we had a larger tree snap near the ground during a storm. The broken tree was left leaning against another tree and looked likely to fall to the ground during a subsequent storm. Unfortunately the tree was hanging over our pasture fencing so if it fell all the way to the ground, it would have smashed the fence. We couldn’t just leave it alone to fall down on its own. The first snow of the season arrived in mid-October. Since then, the temperatures have mostly been unseasonably warm – with some 60 and even 70 degree days in late October and early November. It is finally begun to turn into winter and regular snow flurries will become a common occurrence. I took a couple of short videos of the falling snow as it is quite relaxing to just look out at the snow (especially when there is limited accumulation and no need to shovel or venture out on the roads!). Click through to see more relaxing videos of the falling snow. We have a lot of trees on our property, including a lot of trees around the yard near the house. We like trees and they provide good shade in the summer and habitats for local wildlife. However, this fall our yard was almost completely covered in leaves. For a good portion of the yard, by the time the trees had lost most of their leaves, the leaf cover was at least 2 inches deep. 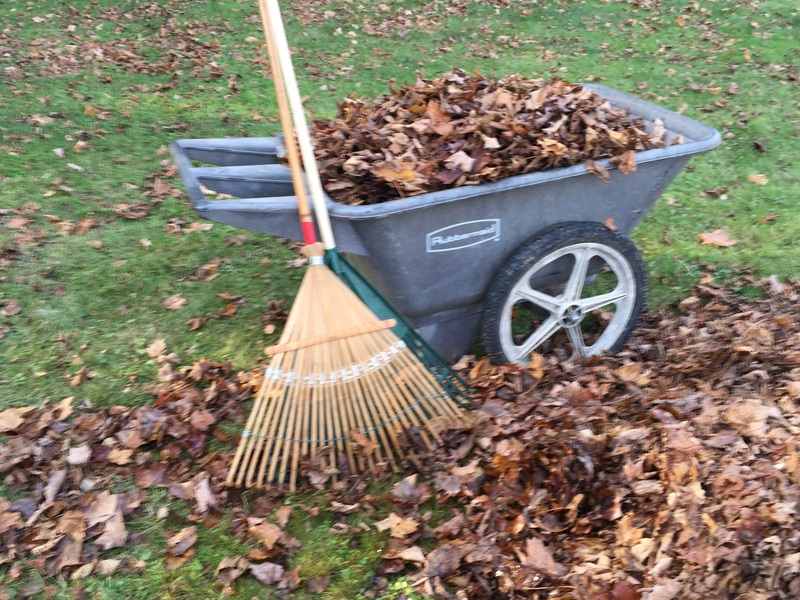 Raking the excess leaves after mowing. Click continue for photos of the massive leaf compost pile. 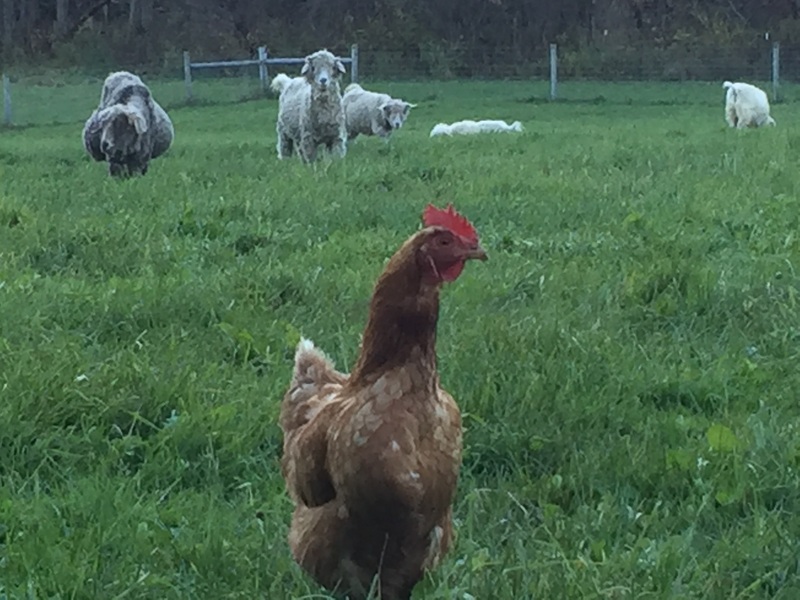 Our most independent hen, Mindy, often spends a part of her day hanging out with the goats. While most of the other hens are either unable or unwilling to get over the fences separating the pastures, Mindy goes right on over the gates to search out the best places to scratch for food. Below is a picture of Mindy out in the middle of one of the larger pastures as the goats graze in the background. Mindy out in the field with the goats. Click through to see more of Mindy with the goats. 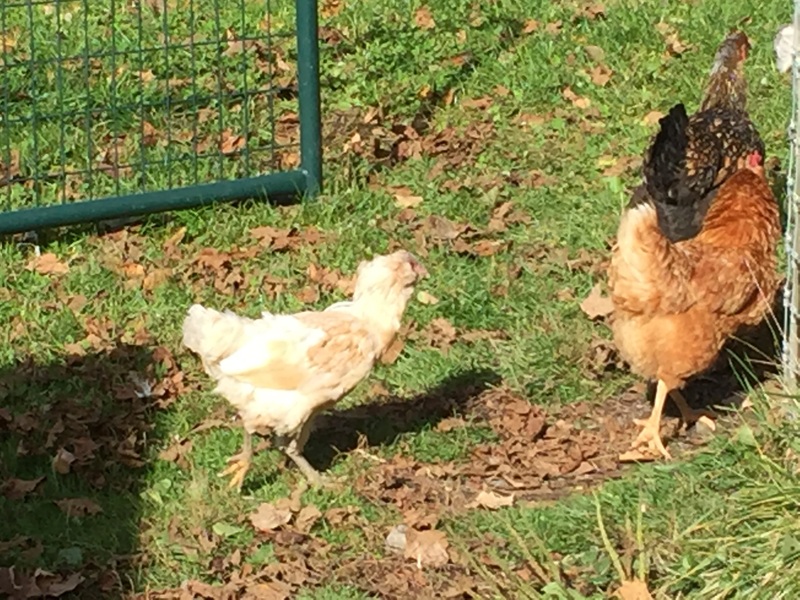 Our chickens are losing most of their feathers! 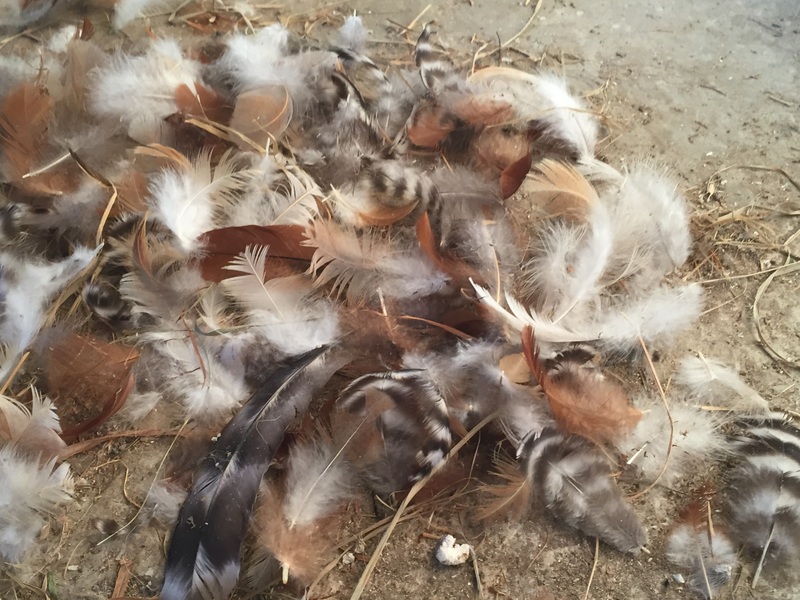 They are leaving piles of feathers all over the place and egg production is way down (only 1 egg per day down from 4+ per day over the summer). A bedraggled hen with missing feathers. What is the cause of their current distress? One of the recurring farm chores is to clean out the chicken coop periodically. The cleaning process can take anywhere from a few minutes to several hours depending on how long between cleanings and how thoroughly you want to clean the coop. Chickens coops don’t need to smell bad and a bad smell (usually a strong ammonia smell) is usually an indication that cleaning is actually long overdue. The chicken coop right before fall cleaning. 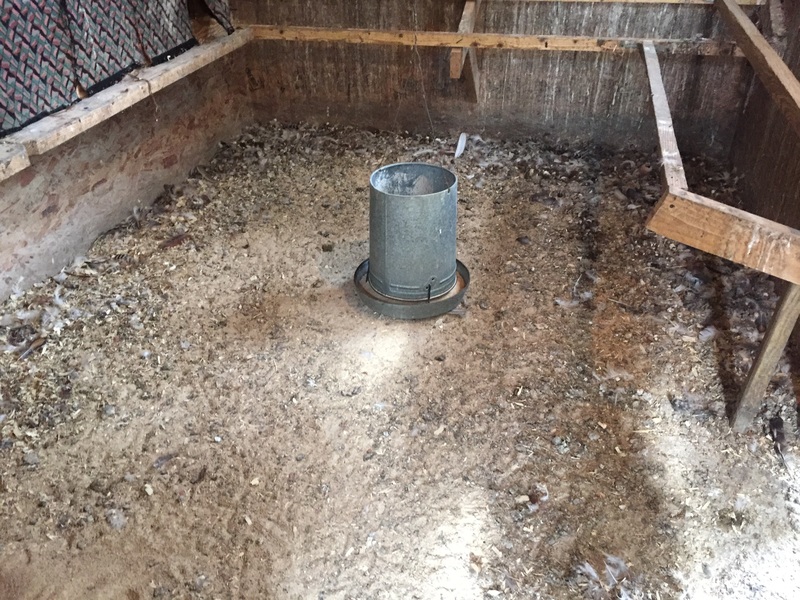 Click through to see the before and after pictures from the coop.